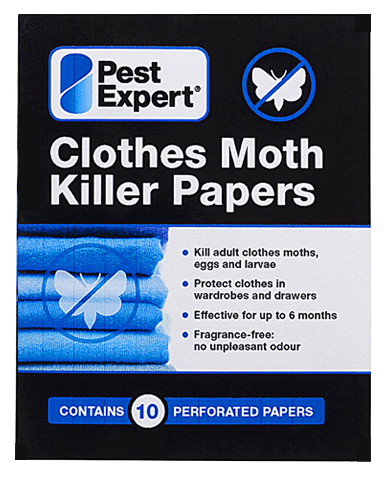 Pest Expert Clothes Moth Killer Strips are a highly effective moth control product, designed for protecting your wardrobes and drawers from clothes moth infestation. These new-to-market Moth Killer Papers contain the powerful moth-killing insecticide transfluthrin (0.49%) which is effective against clothes moth eggs and larvae as well as adults. Each 5-piece strip protects a storage space of 1 cubic m - 1 or 2 large drawers or a single wardrobe - for up to 6 months. The 10 individual papers can be separated by tearing along the perforations and used to line drawers, inserted between layers of clothing, attached to internal panels of wardrobes or placed over garment hangers to protect your woollens, silks and cashmeres. Each section of moth paper has an easy-to-use calendar to indicate when they need to be replaced. For complete clothes moth protection use after applying the moth killing insecticide Formula 'C' and fumigating with a Moth Killing Fogger. 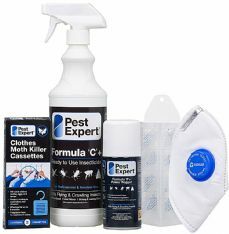 Please also see our Clothes Moth Killer Kits for a comprehensive moth treatment package. Glad to be able to say that the moths have disappeared. These are brilliant for slotting in between my clothes in drawers. Also like the fact that they are fragrance free. My order arrived very quickly. I assume they will keep my clothes moth free. Great service and product These moth strips really work, this is my fourth order! Went for this having used a couple of other sites that now seem defunct. No complaints at all. Products arrived well packaged and in good time. Highly recommended. I have used this company for several years and find them excellent value and providing an excellent service I have found this company to be excellent value and providing a fast and efficient service. I would recommend them without reservation. Great choice, great prices, great service, quick delivery This is the second time I've ordered from mothkiller.co.uk and I'd definitely recommend. The prices are very competitive and there was free postage for orders over a certain value. Products are really effective (sadly it seems like a great summer for moths!). Great updates via email on the progress of my order and everything arrived really quickly.